* The remaining 6 spots will be filled with our "Be Beginners" students. You will be contacted by Suzy to confirm placement. This workshop will be a fun and supportive adventure into the building blocks of improvisation! Kids will learn about positive game play, being creative together, focus and storytelling. We’ll play a ton of games and get better at sharing the story together! Expect to laugh, play and learn a lot in this high energy class. 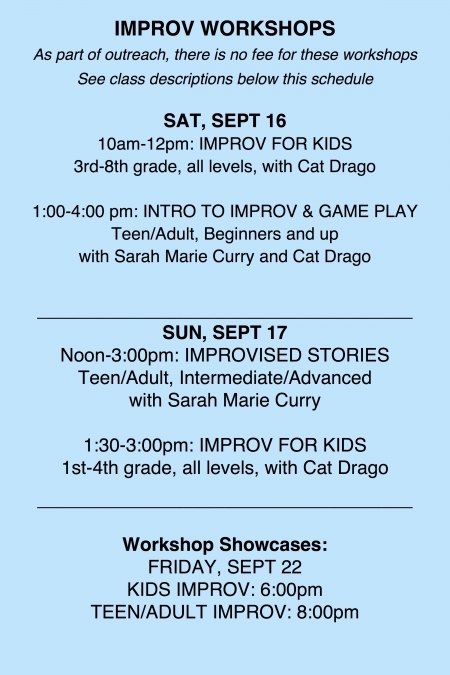 Learn the basics of improvisational game play and theater! The basic tenets of improvisation can improve your real life in a myriad of ways too, from social interactions, workplace relationships and better communication with your loved ones. Students will learn the building blocks of a fun and imaginative playful way to live life on and off the stage. Just show up ready to laugh and learn! This class will teach students how to excel at narrative improvisation. It’s actually much easier than it sounds! We are storytellers. We watch stories every day, we tell stories to each other all the time, and the ability to do this is in our very bones. Actors will learn the simple tools and techniques to create moving, hilarious, poignant stories on the spot. Fully improvised! Students will discover new and surprising depths to their work instantly through basic improv concepts: focused listening, commitment, organic discovery and sincere response to moment over context and the obligation to “perform” resulting in a profound ease and strength to improvising a narrative story.